Took a wee trip to Ardentinny to have a look about,an area I’m ashamed to admit I’ve never walked or cycled. 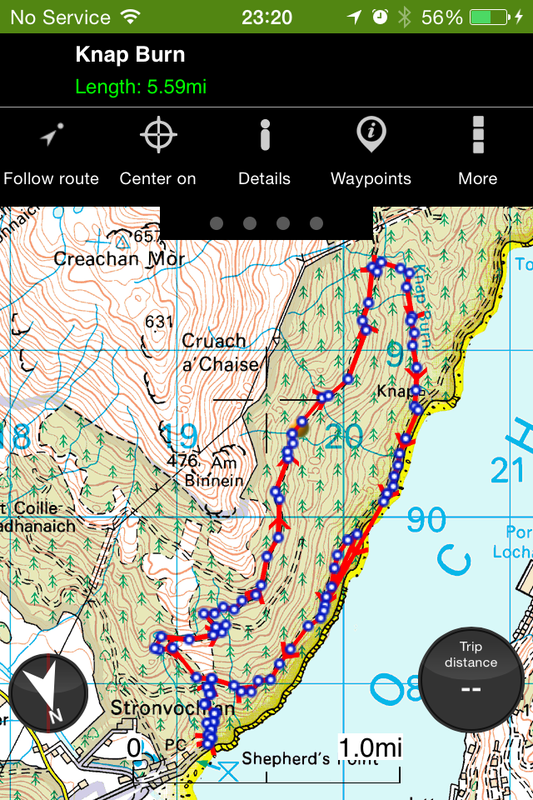 Main objective was to look for an access route onto Creachan Mor,whilst i was there i decided to check out the ‘Knap Burn’ route, signed by the Forestry Commision. Found an accesss to the hill via the pylons that cross the lower section of the hill,not ideal but once on the hill it’s easy enough to divert away from them. Continuing on,I checked the GPS and a 5 mile route on forestry roads looked straight forward. Heading NE on the forestry road prior to heading down to ‘Raven’s Rock’ and down to Knap before returning on the lower road to the woodland walk. The section in the NE between the Upper and Lower road is more of an ATV track……….an overgrown one at that !! Doesn’t seem to have been much or any maintenance carried out in this section for a while,quite hard to spot the track from the top road. There’s the reamians of a building at Knap,an ideal Bothy project!!! I had also noticed a sign at the FCS car park stating the Carrick trail was closed due to damage to the road……….they weren’t wrong !!! Next time i return,it’ll be for a trip to Carrick and back or to conquer Creachan Mor.